Natural Fatty acid esters can be converted into long chain (saturated or unstaturared) biobased diols via an orthogonal tandem catalysis process: i.e. self-metathesis of the unsaturated acid ester, followed by a catalytic ester hydrogenation protocol. 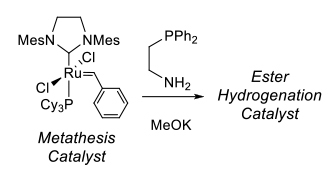 An unique feature developed by Innosyn is based on the sustainable use of Ruthenium: upon addition of a base and a very simple ligand (ethylamino phosphine), the metathesis catalyst is transformed in situ into an efficient ester hydrogenation catalysts. This tandem procedure was demonstrated to be useful for the preparation of the fragrance Mefrosol.